Goddess Durga is considered by Hindus as the mother of the universe. It is also believed that she is the power behind the creation, destruction and preservation of the world. She has been worshiped as the supreme power of the Supreme Being since time immemorial. She has found a place in many scriptures like Taittareya Brahman, Vajasaneyi Samhita and Yajur Veda. The word Durga is derived from the Sanskrit language where it means a fort or a place that is hard to overrun. Another meaning is Durgatinashini that translates into the one who removes all sufferings. So, Hindus believe that Goddess Durga will eliminate their sufferings and protect them from all the evils of the world. Goddess Durga has several incarnations such as Ambika, Bhagvati, Bhavani, Gauri, Kali, Kandalini, Java, Lalita, Rajeswari, etc. 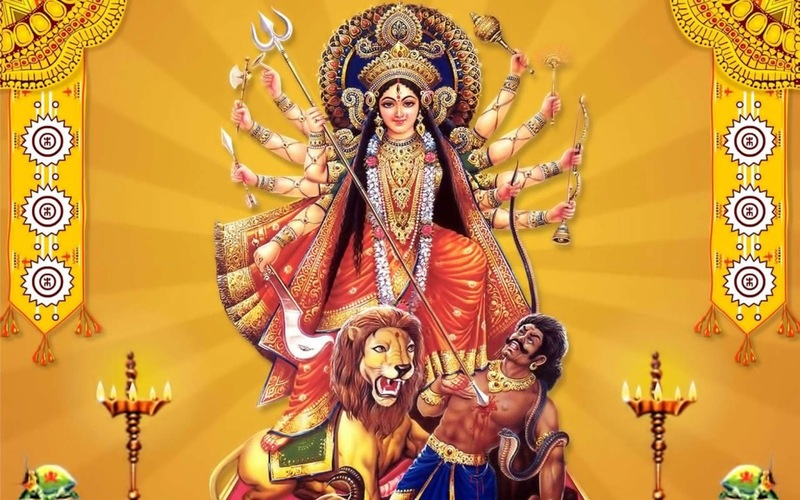 She is also considered to be the united power of all the divine beings who offered her the necessary weapons and physical attributes to kill the demon named Mahishasur. The nine appellations of Goddess Durga are Kusumanda, Skondamata, Kaalratri, Shailaputri, Katyayani, Brahmacharini, Maha Gauri, Siddhidatri and Chandraghanta. In most of her images, one can see that Goddess Durga has eight or ten arms that represent eight quadrants or the ten directions in Hinduism. It suggests that she protects all the devotees from all the directions. This deity has three eyes so she is known as Triyambake. Her left eye represents desire, the right one represents action and the central one represents knowledge. They also represent the moon, the sun and fire respectively. A lion is the vehicle of Goddess Durga and it represents determination and will. Her riding the lion represents her mastery of all these qualities. It also suggests that a devotee must possess all these qualities in order to get over the demon of ego. One hand of Goddess Durga has a conch shell that symbolizes the ‘Pranava’ or the mystical word ‘Om.’ It indicates that she is holding on to God in the form of this sound. Another hand of the deity has bow and arrows which represent energy. By holding them she is representing her control over potential and kinetic energy. She also holds a thunderbolt which represents firmness. A devotee must be firm like a thunderbolt in real life. As a thunderbolt can break anything without damaging itself, a devotee must also face all challenges head on without losing one’s convictions and confidence. A hand of Goddess Durga also has a lotus that is not fully bloomed. This signifies certainty of success and not its finality. In Sanskrit, a lotus is known as pankaja which means born of mud. Hence it stands for the constant evolution of spiritual quality of all devotees amidst the worldly mud such as greed or lust. She holds a Sudarshan-Chakra, better known as a beautiful discus that spins around her index finger but not touches it. It represents that the entire world is acquiescent to the will of Goddess Durga and it is also at her command. The deity uses this weapon only to destroy evil and create an environment that is favorable to the growth of righteousness. Goddess Durga also holds a sword that denotes knowledge that has the sharpness of a sword. The shine of this sword represents that the knowledge is free from all doubts. One of her hands also holds a Trishul or Trident that represents three qualities, Rajas or activity, Satwa or inactivity and Tamas or nonactivity. It also symbolizes that she ends three types of miseries of her devotees, physical, spiritual or mental. The pose of the deity is Abhay Mudra which represents an assurance of freedom from fear. In this pose, she says to all her devotees that you should surrender all the duties and actions onto me and I shall release you from all kinds of fears.